Sinus congestion, also known as rhinitis, can be caused by viral infections, allergies, sensitivity to dry, cold or damp air, and many other triggers. For some people it's chronic and for others it's occasional, but for everyone it's universally unpleasant and frequently debilitating, leading to headaches, lost sleep and poor concentration. Known in Ayurvedic medicine as dushta pratishyaya, sinusitis is an ancient problem that the modern world seems to have made worse. Of course, there are scads of over-the-counter medications, but their side effects are abundant. If you're looking for a more natural path to sinus relief, yoga has a few answers for you. Yoga's biggest gift to the sinuses is balancing the body's immune response, which basically goes into fight or flight mode when allergy season comes around. So whatever poses you do, keeping your yoga practice on a low-stress trajectory without heaping too many expectations on yourself is likely to benefit. Stress, after all, triggers inflammation. Hot yoga is better avoided when the sinuses are in bloom because heat will just irritate the tissue. There are also certain categories of poses recommended for funky sinuses. Inversions, such as downward facing dog, Sarvangasana (shoulderstand) and Halasana (plow pose) may help sweep out the sinuses and upper respiratory tract, assist in draining nasal secretions and oxygenating the blood-flow to the oral cavaity by stimulating circulation. Standing poses such as twists and forward and backward bends stimulate points along the spine, the thoracic area and energize the lung meridians, which help to recalibrate immune system functions. There are many forms of pranayama (breathing exercises) but one that is clinically proven to relieve sinusitis is Anuloma-Viloma Pranayama, or alternate nostril breathing. In a 2013 study published in Ayu, 40 people who practiced it for 40 days reported that symptoms of nasal drip, headache, itchy nostrils, sinus pressure and other symptoms improved by an average of 50 to 70 percent. The researchers attribute the improvement to increased oxygenation of the nasal tissue. To perform: Sit in a cross-legged position. Place your right index finger at the center of the forehead between the eyebrows. Exhale completely. Use your thumb to close the right nostril and inhale through the left nostril to a count of four. Hold to a count of sixteen, then release the right nostril while blocking the left with the middle finger. Exhale through the right nostril to a count of four. Repeat 10 to 15 times. You may adapt the timing and duration to your own capacity. Reflexology is a method of stimulating or soothing various zones of the body by applying pressure to the feet or hands. According to Yoga Journal, the toes correlate to the sinuses. "Thumb walking" at the toes' ridges and along their flat surfaces stimulates energy in the sinuses. Thumb walking at the sides of the toes targets the sinuses in the cheekbones and thumb walking the toes' bottoms lights up the ones at the lower forehead, those behind the nose, and may open the sides of the nose. 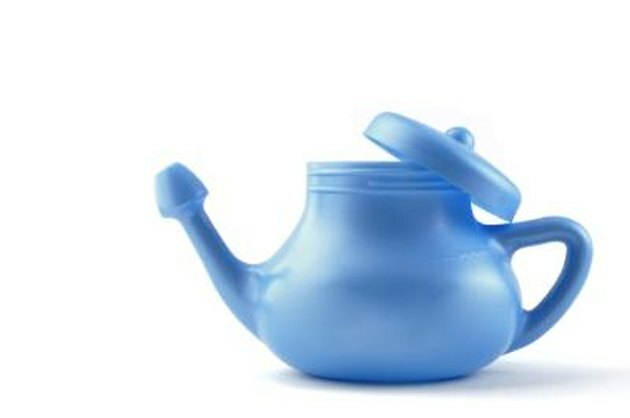 Last but certainly not least is use of the neti pot -- or a plastic squeeze bottle -- to flush the sinuses with salt water. Neti pots are readily available in most pharmacies with pre-measured saline packets. They've been proven highly effective in preventing infection, soothing sinuses and preventing colds and infections. Whether you use a neti pot or a squeeze bottle, the goal is to shoot the water up into one nostril, have it circulate at the top of the nasal cavity, and run down the other nostril. Then reverse. It feels a little weird at first, but keep at it and you'll soon be a convert. What Are the Symptoms of a Sinus Fungal Infection?